In The Scream Heard Around the World–Manila, Part 1, we saw the far-reaching effects of a speech given by Carlos Cespedes in Cuba and how it spawned a movement for freedom in both Cuba and the Philippines. In The Battle That Wasn’t–Manila, Part 2, we look at how the reach of that scream carried on through a poem and influenced the course of a nation. Today, we investigate the challenges the budding Philippine nation faced, as well as the WWII Japanese invasion. After the U.S. destroyed the Spanish fleet, captured Manila, and subsequently defeated Emilio Aguinaldo and his guerilla forces, the long and slow process of organizing a government for the Philippines began. The young Philippine legislature faced serious challenges to the implementation of unified government. One major obstacle to overcome was the tremendous cultural and linguistic diversity of the 8,000,000 inhabitants of the Philippine islands, who were mainly bonded by two unifying forces. The primary unifying force was the Philippine occupation by Europeans. When Europeans staked their claims over the islands, the various tribes that had lived in a state of enmity and territorial struggle against each other saw that they generally had more in common with each other than with the foreign invaders. The very presence of occupiers from distant lands helped some tribes to begin to overcome age-old animosities. The second unifying force in the Philippines was the Catholic Church and its Spanish missionaries. The success of these priests varied from one area to another. In some cases, they were despotic and resented by many of their new “flock.” Working in their favor, though, was the fact that the often-brutal Spanish military forces were reluctant to incur the wrath of the missionaries. This left the priests in the position of being the protectors of the islanders against the excesses of the Spanish occupiers. Overall, the missionaries were remarkably successful in converting the majority of the Philippine people to the Catholic faith, and that religious dynamic helped the vast array of Philippine tribes to find a national identity. One notable exception is that many of the Islamic Philippine people in southern areas were resistant to conversion to Christianity. Even today, they remain a separate group of sub-cultures that do not identify with Philippine nationalism. Another great challenge that the Spanish and later American occupiers faced was the geography of the Philippines. The precise number of islands in the Philippines remains a topic of debate for geographers, but the Philippine government currently accepts 7,107 populated islands as the correct figure. Having a national population divided on so many islands was, in itself, a huge challenge for national identity. Governing the Philippines was made even more difficult by the fact that most of the islands are mountainous, and many of those mountains remain active volcanos. Add to that the fact that the rich soil and tropical climate generate jungle and rain forest vegetation over most of the landmass, and operating an effective government in the Philippines becomes extraordinarily difficult. In 1935, the U.S. and the Philippine National Assembly agreed that the Philippines should be able to achieve full independence by 1945. The U.S. granted the Philippines commonwealth status, and General Douglas MacArthur was appointed chief military advisor. In 1937, MacArthur retired from the U.S. Army. According to him, he then begrudgingly accepted the title of Field Marshall of the fledgling Philippine Army, so as “to not insult the Oriental sensibilities” of Philippine President Quezon. According to Philippine President Manuel Quezon, MacArthur had demanded the title of Field Marshall, and although Quezon and the U.S. Army thought it was a bit ridiculous, he agreed to the demand because he recognized MacArthur’s skills as a brilliant administrator and military leader and wanted him to remain in charge of the development of the Philippine Army. While Japan continued to extend its conquest of China and the U.S. remained hesitant to become extensively involved, MacArthur, with very limited resources, began to build a Philippine Army. Though the recruits were enthusiastic, their lack of equipment and supplies severely hampered their development. On December 7, 1941, any doubt about U.S. involvement in a war in the Pacific evaporated when a Japanese naval task force conducted a carrier raid on the U.S. Naval Base at Pearl Harbor and nearby Hickam Airfield. The Japanese enjoyed early naval and air superiority in the Philippines area, and from December 8 to December 22, they landed around 130,000 well-equipped, well-trained troops in the Philippines. The Japanese were so confident in planning their Philippines campaign that they estimated they would vanquish MacArthur’s force of 150,000 mostly untrained, poorly equipped troops in only three weeks, by January 15. Their timetable for Japanese conquest of the South Pacific was built on this assumption. They intended to swiftly conquer the Philippines and then use the majority of the same ships and air forces that winter for the conquest of the Solomon Islands and New Guinea, and for attacks on Australia. The Japanese were to be disappointed. General MacArthur’s troops fought well past the Japanese January 15 deadline. However, by March, it was clear to U.S. President Roosevelt that the U.S. would not be able to break through the Japanese to reinforce the Philippines, and that the Japanese would soon complete their conquest of the island nation. Roosevelt ordered General MacArthur to make his escape. The U.S. and its allies continued fighting and held out until their surrender on May 8, 1942. That surrender is remembered as one of the worst military defeats in U.S. history. However, by holding out so long, the allied soldiers had managed to disrupt the Japanese plans for the destruction of Australia. The Japanese lost around 30,000 soldiers in the Battle of the Philippines, and many of the remaining soldiers were unfit for further combat. The Japanese High Command was beside itself that things had taken that long. The conquering Japanese forces treated the defeated U.S., allied, and Philippine forces barbarically. Japanese troops murdered many of the surrendered troops for recreation as they marched their prisoners 90 miles without food or water in the sweltering heat. 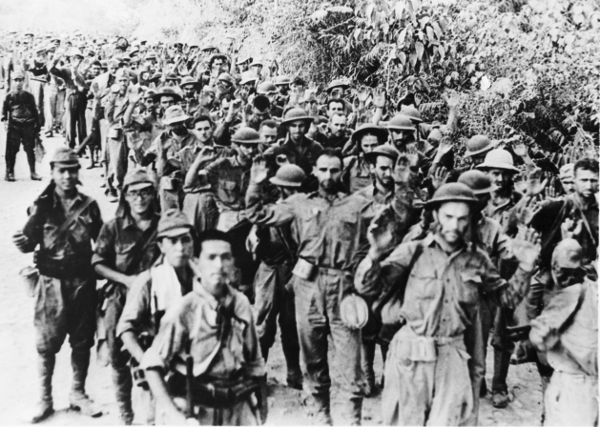 That forced march in which nearly 11,000 prisoners died is remembered as the Bataan Death March. Thousands more soldiers died during captivity in P.O.W. camps due to starvation, torture, and lack of medical care. Those American and Philippine soldiers that did manage to survive the Bataan Death March and the subsequent three and a half years of brutal captivity are still remembered with well-deserved reverence by U.S. and Philippine military personnel. Sadly, the Japanese Army treated innocent Philippine civilians with a similar contempt and brutality. It would take two and a half long, bloody years of war before MacArthur could make good on his pledge to return to the Philippines. In our next episode we will examine the liberation of Manila. Jay, this is a footnote to your well-crafted story. After the defeat of Japan, the U.S. agreed to not hold trials for military crimes against officers and the high command of the Japanese Army for their treatment of prisoners-of-war. This agreement was supposedly predicated in part on a secret deal in which the Japanese would turn over all documentation of tests of chemical weapons carried out in some internment camps. I know of this from my father telling me that, following his discharge after the war, a representative of the U.S. Army contacted him in person when my father refused to sign a paper stating the Japanese had not conducted chemical weapons tests on human subjects. My father told his story of what happened at Mukden, Manchuria, during his 3 1/2 years of imprisonment there. My father subsequently received a letter from the Dept. of the Army apologizing for their error. I admired that my father never held a grudge against Japan or its people. When the war ended he was 26 years old. He married the WAC nurse who cared for him at Madigan Hospital following his return. I am one of the two children he raised. He died of late-onset Parkinson’s Disease at the age of 90. Thank you for your well-written story of the fall of Allied Forces in The Philippines. You honor those who served. Hi Mike. Thank you for the compliment. General Yamashita was tried, convicted and hanged for the atrocities in the Philippines. He claimed that he was innocent of the Manila slaughter, and that he was unjustly tried. Though he might have been innocent of what happened in Manila, he could have been justly executed for the war crimes that he committed in Malaysia and Singapore. I have no sympathy for Yamashita. I wish your dad had written a book. I think that he was right, but that there were also other forces at play concerning the US decision to not try and execute all the deserving war criminals in Japan. I think that it had more to do with quickly converting Japan into a forward base against Soviet and later communist Chinese imperial aims. In this we were successful, but in exchange people like your father never received justice. In retrospect, I would have made the same decision. It was an exchange of one evil to avoid an impending greater evil. My father served in the Philippines, and, like your father, he preferred not to talk about it. It was after his death that I read some of his saved letters and confirmed my assumptions about what he felt. Like your father, he held no grudge against the Japanese people. He saw them as also being victims of the terrible Japanese oligarchy that started the war in Asia. Interestingly, the situation in Germany was similar after WW2. Sadly, many known SS war criminals were released from captivity. The underlying reason was the same–the imperial ambitions of the USSR. I salute the memory of your father and all of his generation that stood against such horrible evils. If they had failed, we likely would be living in a terrible darkness today.